Bewley's Hotels Blog: Michael Buble Concert - Extra Tickets going on SALE - Thursday 27th June at 9am! 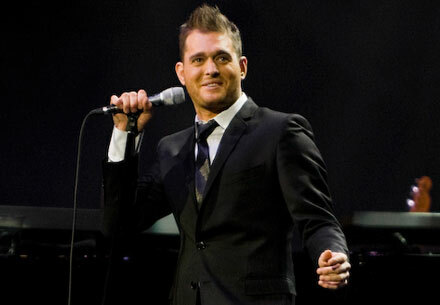 Michael Buble Concert - Extra Tickets going on SALE - Thursday 27th June at 9am! There is still a chance to get tickets for the "one and only" Mr. Michael Buble who is coming to town (Dublin) for a 5 night show at the O2. 15th July 2013 - Bus to 02 leaves Bewley'sHotel Leopardstown at 6.10pm & Bewley's Hotel Ballsbridge at 6.30pm. Arrival time at the 02 is 7 pm approx and departure from the 02 is scheduled 20 minutes after his last song. Shuttle Bus const €10.00 return. 16th July 2013 - Bus to 02 leaves Bewley's Hotel Leopardstown at 6.10pm & Bewley's Hotel Ballsbridge at 6.30pm. Arrival time at the 02 is 7 pm approx and departure from the 02 is scheduled 20 minutes after his last song. Shuttle Bus const €10.00 return. 18th July 2013 - Bus to 02 leaves Bewley's Hotel Leopardstown at 6.10pm & Bewley's Hotel Ballsbridge at 6.30pm. Arrival time at the 02 is 7 pm approx and departure from the 02 is scheduled 20 minutes after his last song. Shuttle Bus const €10.00 return. 19th July 2013 - Bus to 02 leaves Bewley's Hotel Leopardstown at 6.10pm & Bewley's Hotel Ballsbridge at 6.30pm. Arrival time at the 02 is 7 pm approx and departure from the 02 is scheduled 20 minutes after his last song. Shuttle Bus const €10.00 return. 20th July 2013 - Bus to 02 leaves Bewley's Hotel Leopardstown at 6.10pm & Bewley's Hotel Ballsbridge at 6.30pm. Arrival time at the 02 is 7 pm approx and departure from the 02 is scheduled 20 minutes after his last song. Shuttle Bus const €10.00 return. Note - he is a wanted man, so make sure and get in early! !